Beneath the Waves is a full game using some of the mechanics of my Ludum Dare game “Waves.” It’s got a pretty big world, and combines platforming with fast-moving underwater exploration. Is there more than one ending? I can’t seem to find any other ending. There is a single ending. Awesome! I felt some Lovecraft in it, since all the sea creatures scared the hell out of me. There’s even the (IFILW)TMOC guy! I also tried to find another ending, before reading the notes that is (the “Replay final idol” suggests there’s one). Oh – and please make falling feel a bit more like falling, with different sky patterns. Since in many places you dive from up high, adding to this experience would be great. It’s excellent, but I already told you that. Glad to see it finally online! Nice game. Good atmosphere, and an interesting design with some cool mechanics (as usual). Some superficial changes might be worthwhile though. I liked the sound and some of the visuals (shadows on the rocks, design of the sea creatures, and the shift in tone when you took an idol), but overall it felt a bit crude. Increasing the size of the player’s character, or just using a closer default perspective might’ve helped here. Reducing the speed of the character’s movement (especially swimming), and the inertia while underwater might help too. Some people are easily put off by superficial things, which would be a shame since your games are among the best I’ve played for atmosphere and mechanics (including non-flash games). Loved it, not as much as your previous works, but still an awesome game. Keep up your work, I look forward to it. The game was great, the game was a bit short though (Aren’t they all?). The story was a bit bland and the ending was a pile of crap compared to the gameplay (There, I said it). 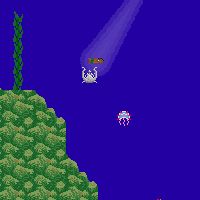 The gameplay is very innovative but not untouched on by any other games, though as you said “It was inspired by other platformers such as Ecco the Dolphin”. I’d give the game a 4/5. I almost didn’t approve your comment; “pile of crap” is insulting and unhelpful. What about the ending did you dislike? Do you plan to share the Flixel optimizations you mention in the notes? The zoom thing really impressed me. I should do so. I’ll see if I can put together a release. It’d definitely be a bit sloppy, as I don’t have the resources right now to package up a polished library. I liked this quite a bit. I don’t know if it was intended for me to get totally confused on the way to the Monstrous Idol’s platform, but I still did. I liked how the enemies created tension even though there wasn’t all that much punishment, especially at the end when I was trying to get to the last platform. Possible bug: I lost the Kraken idol back to Naija in the first chamber (l33t skillz, I has them), and she seemed to get stuck in the reef just below the platform — I couldn’t get the idol back from her and had to restart from the Monstrous Idol. I enjoyed it, I really appreciate that you’re trying to both tell a story and create a game. On an interface level, the controls felt a little bit ‘twitchy’ above-ground. Many times I knew exactly what I wanted to do and ended up over-shooting and having to start the “climb” over again. Can you post a zoomed out version of the map? I’d be interested in seeing it as a whole! I wonder if the ending was good or bad? Phenomenal game. I was really impressed with the quality and attention to details this game had. Then you go back to the main menu and see how the world consumed by light looks like. At least you can see the world wasn’t destroyed, but it’s hard to distinguish buttons (I guess the remaining earthly creatures can live with that). Interesting game. My take on it was that it was a story about love and it’s shortcomings. The Sky God and Sea God loved each other, but that couldn’t keep them together and couldn’t stop the Sky God from wanting to take back his gifts. The Tentacle Monster may have loved the human (and maybe vice versa? ), but that didn’t give them any freedom when it came to playing out the roles they were given. truely a piece of art indeed. Interessting story and despite it’s rather simple gameplay, truely fascinating in it’s own way. A sad ending, but I think it was nessecary for the game. Eventhough many complained that it wasnt a happy ending (indeed actually a bad ending as I took it, since it pretty much sounds like the destruction of the world if it’s getting consumed by the light aka the sun [same goes for the sea though]), I think it was nessecary for the heart and soul of the game. Otherwise it couldnt deliver it’s unique message I still try to grasp. Of course I’d be a liar saying I wouldnt have wished that there would have been a way for the player or rather the swimmer to come together with the Mermaid and leave the final idol be and therefor leaving the world in it’s tie betwen sea and sun, I know that it was nessecary. Afterall stories about lost love are bound to be a tragedy… and how’d there ever be a way for a tragedy to end in a god way? I found this game via a re-tweet. I played it all the way through and very much enjoyed it! I didn’t like the controls as much… I felt I didn’t have enough control, but that didn’t stop me from going further until I finished it. I wouldn’t mind seeing an expanded version of this game world, characters, and game mechanics, and I’m talking about something blown up to a commercial scale like a downloadable through a console or steam and that kind of thing! So I guess Beneath the waves being the finished product is the reason why you never put Waves in your MyGames page. Leaving Waves off of the My Games page was an oversight. It’s been on the sidebar under My Games for a while now. Hi, I played through the game pretty quickly and enjoyed it. One thing that was a bit of a source of frustration was how it wasn’t always so obvious during the platforming parts what was foreground and what was background. More than once, I tried to step on a platform, only to find that it was just background. It also wasn’t too clear when I would be able to wall-grab and when I couldn’t.